Al-Mihtwish is located northeast of Ma’ale Adumim, southwest of Kfar Adumim, and near Road No. 1 leading to Jericho, to its north. The community there is originally from Tel Arad, having arrived after being deported in the 1950s and settling with the agreement of private landowners, residents of A’nata. 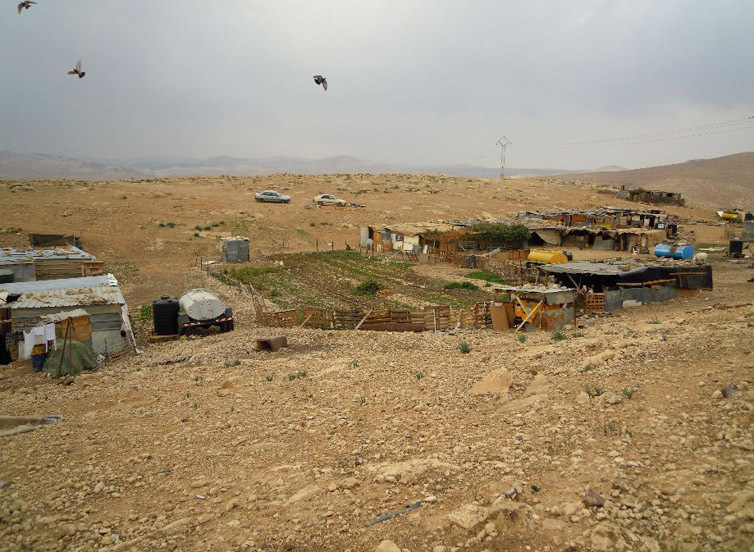 Today, some of the lands in the northern part of the community remain under private ownership, while the southern portion is lands taken in the 1975 expropriation and included in the Ma’ale Adumim master plan. A small portion of the lands are registered state lands. The northern part of the community is located on lands slated for the construction of a road planned to connect A’natot Junction with Road No. 1, while the southern part is boxed in between the plan for the extant Road No. 1 and the plan for the new road. 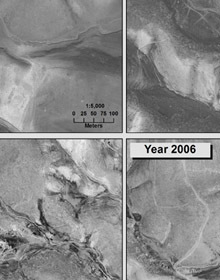 Historical analysis reveals continuous settlement there since the 1970s, which became more intensive beginning in the 1990s. Today, Al-Mihtwish is organized in 5-6 clusters, according to families, mainly in the wadis and along the hill slopes. Building within the clusters is relatively dense, due to restrictions imposed on residents that prevent them from spreading out. However, as long as a cluster is family-based, life can carry on even with relative physical proximity between units. In the past, there were a number of cases of house demolitions, and demolition orders were issued for buildings in various clusters during the 1990s and again in 2011. Recently, no demolitions have been implemented, but any new building or addition to existing buildings is prohibited. Initially, residents were nomadic on a seasonal basis, in keeping with the needs of the flocks, and subsequently, they settled permanently. In the past, a number of water sources – springs and wells – were available to them in the nearby area, for example, E’in Fawwar, E’in Fara, and E’in Qilt, but today, access to these water courses is blocked since they are located in closed areas, whether nature reserves, military bases or settlements. 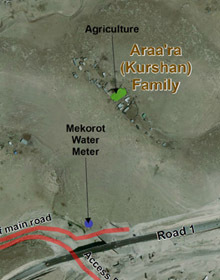 At present, as in the other clusters of Al-Khan Al-Ahmar, residents receive water through a meter of the Mekorot Company, which they acquired in 1990. The water is supplied several times weekly, but there are periodic breaks in the water supply. Residents claim that the Palestinian Authority pays the water bill on their behalf, and they view this as compensatory reimbursement for the few services that they fail to provide them with despite their obligation. Until a few years ago, residents had a large number of flocks. With intensification of limitations on movement and mobility, in addition to the confiscation of flocks, they were forced to sell most of their holdings, since it is becoming increasingly difficult to maintain them economically and in terms of accessibility to pasture. Today, a very small number of specimens live mostly in pens, and supply domestic needs only. Residents cultivate very small plots of land near their homes on which they grow various vegetables and other plants for basic home use, and in addition, there is a common plot, approximately 700 sq. m., adjacent to the mukhtar’s diwan (the communal tent of the community leader), where vegetables are cultivated on behalf of the entire community. The drip irrigation system is partially financed by the Italian organization Vento di Terra, which also initiated the school building in Abu Al-Helw. This plot of agricultural land provides what little work there is to partially counter the unemployment. The individuals who work the land until recently received a salary from UNRWA. For the time being, the UNRWA project has been suspended, but the women are of course continuing to cultivate the plot.